Even later than usual, but I thought I should at least get the first post out in time for the Oscars. I spent quite a lot of time last year looking at flowers and butterflies. The names alone are a joy: sainfoin, silverweed, sanicle, harebell, yellow rattle, round-headed rampion, devil’s bit scabious, horseshoe vetch. There were actually hundreds of them at Rye Harbour, and I tried to get a picture with a cluster, but my iPhone’s autofocus just couldn’t cope. And perhaps the instinct to choose something a bit rare or unusual is a bad one; for sheer pleasure, it’s hard to beat the green glow of the sun shining through young beech leaves, or a sweep of bright gold coconut-smelling gorse flowers. 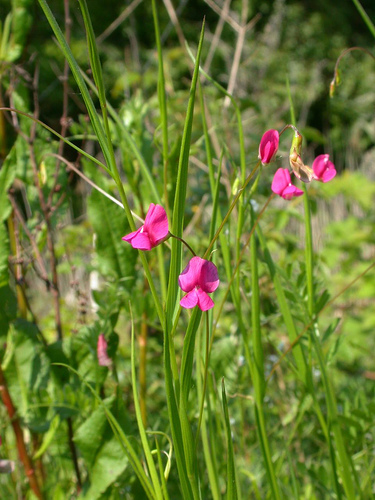 But my stand-out plant of the year is a curious flower called Grass Vetchling, one I’d never heard of before I saw it. What’s fascinating about it is that it really does look incredibly like a piece of grass… except with a gorgeous little magenta flower on it. That photo is © –Tico– and used under a CC by-nc-nd licence. You can get a clearer idea of just how much the plant looks like grass from the photo is this blog post (click for a larger version). It almost looks like an example of bio-mimicry, but it’s hard to imagine the evolutionary advantage of looking like grass. 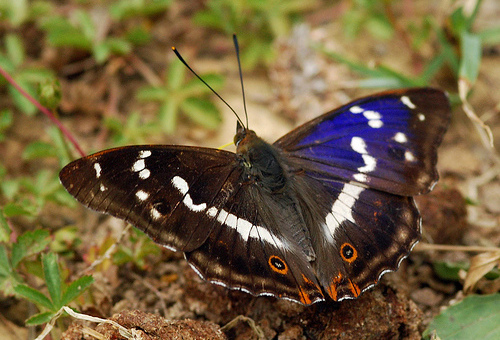 Last summer I made a particular effort to look for butterflies, sometimes with my father, who is keen on them; specifically, I made it a bit of a project for us to see a Purple Emperor, the UK’s most glamorous butterfly. And after a slightly miserable wet spring, the summer was properly hot and it turned out to be a particularly good year for butterflies. There were some amazing numbers of Purple Emperor being seen in a wood in Northamptonshire, so we made the pilgrimage up there, and sure enough we saw dozens in flight and several sitting on the ground flashing their purple at us. I also got several other firsts this year: amazing iridescent Adonis Blues, in their hundredson Malling Down although, it being a cool day, all sitting on the ground; the much less spectacular Silver-studded Blue in huge numbers on Chobham Common, Brown Argus, Silver-spotted Skipper and Dark Green Fritillary, plus Grayling and Wall, which I’m sure I’ve seen before but possible not in the UK. It was also a good year for Clouded Yellow, and I saw quite a few of those fluttering around the north Kent saltmarshes. In total, I saw 35 species of butterfly in the UK last year, which is surely a personal record. Also a few non-butterfly insects of note: the amazing iridescent green Rose Chafer beetle and its less exciting relative the Garden Chafer; a couple of longhorn beetles, Rutpela maculata and Agapanthia villosoviridescens, and a longhorn moth, Adela croesella. The striking Golden-ringed Dragonfly, and the Ruddy Darter, which I’ve no doubt seen before but now know how to distinguish from its commoner relatives. And best of all, the fabulous Beautiful Demoiselle. It involved a long trip to a slightly dingy bit of woodland after several failed attempts elsewhere, and was therefore just a tiny bit more stressful than butterfly-hunting should be, but I think I have to award Insect Of The Year to Purple Emperor. Because it really was the fulfilment of a lifetime ambition. For me and my father. The photo is © Paul Ritchie and used under a CC by-nc-nd licence. I actually had a non-insect invertebrate as a target species last summer: the Wasp Spider. But despite several attempts, I couldn’t find one. So the winner is the edible snail, Helix pomatia. And yes, it is the big fat one commonly eaten with garlic sauce. Known as Roman Snail, because it was introduced to the UK by the Romans — presumably as a foodstuff — and there are still a few in the south of England. I saw an adder briefly as it disappeared into a bush. So that was good. Can’t think of anything for this category. There was masses of toadspawn in the pond this year, and the toadlets were very cute, so I guess toad is the winner by default. Otters have made a comeback over the past few decades, but you never actually see them. But I was in the Lee Valley during the January cold spell, and I saw something walking over the ice, and for a moment I thought perhaps the extreme weather had forced one out into the open during the day… and of course it was an [introduced, American] mink. Still, it was an exciting moment and an attractive animal in its own right. 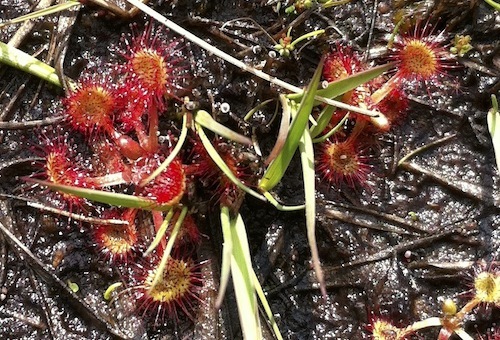 Biodiversity is a marvellous concept burdened with a terrible bureaucratic name. It’s not difficult to explain intellectually, but people don’t have an instinctive emotional connection to it. And it’s not always very obvious, even when you’re in the middle of it. Even in the most famously biodiverse habitat, tropical rainforest: a casual visitor walking through it will often be a bit disappointed, because what you mainly see is lots and lots of very similar-looking trees. The birds and butterflies and snakes and monkeys and frogs and beetles are all out there, but you often have to work a bit to find them. But anyone can see the difference between a wildflower meadow and pasture which has been ‘improved’ by agriculture. The improved version is attractive enough: a thick pillow of lush green grass, unbroken by anything except perhaps the occasional hardy thistle. That deep vibrant green in spring is a joy to see after the grey of winter, and it seems so full of life; it has become our idea of what the English countryside should look like. But it’s all just grass. It has the ‘bio’ part — it’s producing a lot of biomass — but it’s completely lacking in diversity. Whereas the unimproved meadow is immediately, obviously completely different. It will be covered in flowers, pink ones, white ones, yellow, blue; some hugging close to the ground, others holding their blooms up above the grass, flowers in spikes and disks and whorls. And crawling and buzzing and fluttering, there will be caterpillars, hoverflies, beetles, wasps, and most obviously, butterflies. And you don’t need to be able to identify any of them: you can see the variety. Anyone can see the stark contrast between the lush but boring improved pasture and the messy, rich, complicated wildflower meadow. 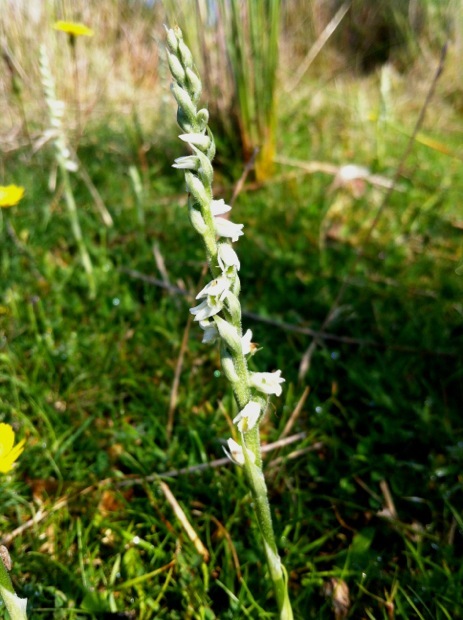 And if you do learn to identify the flowers and insects, the diversity becomes even more apparent, because the mix will vary from meadow to meadow, depending on the soil, the exposure, the amount of grazing and the time of year. A green sweep of ‘improved’ pasture can make for a beautiful landscape, but the wildflower meadow invites you to stop and pay attention to your immediate surroundings, to take pleasure in the details. The harder you look, the more there is to see.